A flavor for those that dare. The closest thing to fire is lava. Dare to take the lava challenge. Are you ready to set your mouth on fire? If so, indulge in our Smokin Lava Beef Jerky, a flavor for those that dare. The closest thing to fire is lava. Dare to take the lava challenge. Each bite will burn a little more until your mouth feels like a furnace. 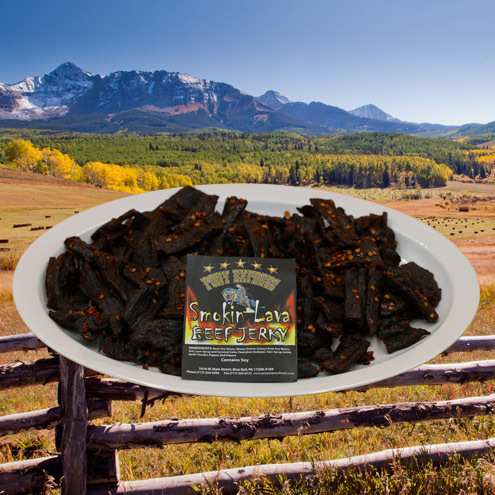 “Hurts so good” is definitely the expression that sums up our Smokin Lava Beef Jerky! Inspired by the days of the Pony Express Riders, our jerky treats all have distinctive flavors. Each out-of-this-world taste is memorable, and you won’t be able to forget the feeling of your tongue on fire when you finish up your first bite of Smokin Lava Beef Jerky. In the Old West, Pony Riders would make treks across the country to deliver mail. They needed nutritious, portable treats to nourish them on this long journey. That inspired our name, Pony Express Foods, and helped solidify our mission to make snacks people can carry for when they need a pick-me-up or just have a craving for smoky, meaty food. Are you interested in placing a large order? You can buy our Smokin Lava Beef Jerky in bulk, saving money on your purchase. The more you buy, the more you save, and the less chance there is that you’ll run out of your favorite snack. We also offer wholesale options for those who want to sell our jerky in their retail locations, like a farmers market or convenience store. Get in touch to learn more about this program. Our whole-muscle jerky uses only the finest ingredients. The result is a high-quality product you may want to share with your friends — or you may want to keep all for yourself. Place your order today.